validating use of rapid spectral techniques to compare counterfeited wines against a known reference wine. A pilot study, funded by Wine Australia, was conducted to assess whether a combination of strontium isotope ratios and selected trace metals could be used to determine a wine’s origin. 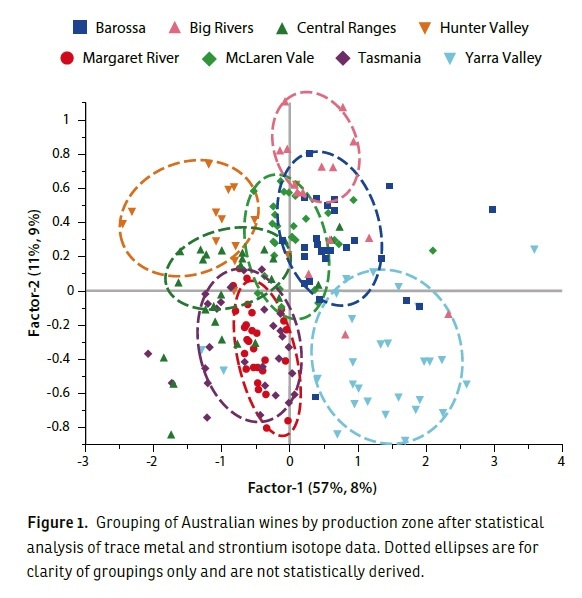 A number of finished, bottled Australian wines (194) were obtained for analysis through the Wine Australia Regulatory Services team, representing eight important production zones. For comparison, 37 wines from other countries were also analysed. The 87Sr/86Sr ratio and 25 trace elements were measured in all wines using thermal ionisation mass spectrometry and inductively coupled plasma mass spectrometry. In addition, the near- and mid-infrared spectra were recorded for a subset of samples and attempts were made to isolate DNA from a set of commercially available wines with the aim of using the DNA to identify the grape variety the wines had been made from. The most important trace metal elements were found to be lithium, rubidium and zinc (along with arsenic, beryllium, chromium, nickel and lead) and these, combined with the 87Sr/86Sr ratio, allowed 95% of samples to be correctly predicted as originating from Australia or not. The variance of the data within Australia allowed several zones to be discriminated from others (Figure 1). Importantly, the wine variety had little effect on the successful prediction rate. By comparison, the quality of the statistical separation observed from mid-, near- or UV spectroscopy was markedly lower and varied according to variety. Despite several attempts and a number of experimental improvements, DNA extraction from wine for polymerase chain reaction replication was not successful. Further development of this pilot study will examine the isotope ratios of other metals, such as boron, lithium and lead as well as stable isotopes associated with water, for use as origin markers. Variation over time will be evaluated by looking at several vertical series of single-vineyard wines and the effect of different varieties will be studied using samples from variety blocks from several different regions.